Hello everyone! It sure has been a while hasn't it? I just got off of school and am now on winter break! Finally. This month has been so incredibly busy, I am a part of my school play and we stayed late many days to rehearse. On top of that basketball season has started up again so I've got practice for that in the morning before school starts. And now unfortunatly I am sick, hopefully I will recover soon. In short I am so ready for this break! 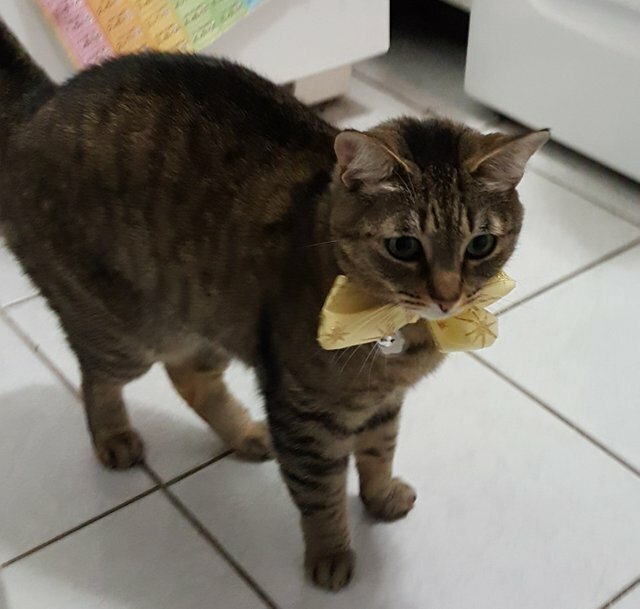 Sometime a week or so ago we put a bow on Pepper thinking she would look really cute in it, but we expected her to try and take it off right away. But here we are a good while after and she still has it on! 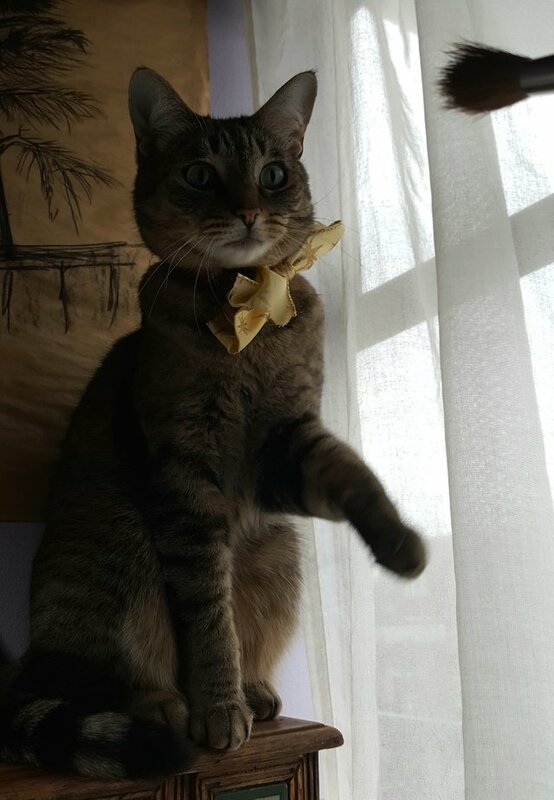 She doesn't seem to mind the bow at all and has yet to try and take it off. I hope that everyone is having a good time and is relaxing. Happy Caturday! 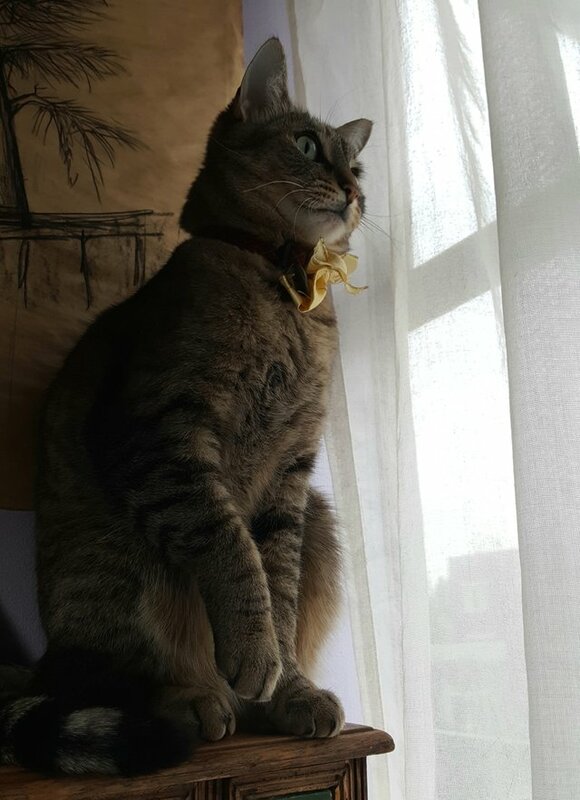 I'm impressed that she is keeping the bow on, but some cats just don't seem to mind "ornamentation." Congratulations! This post has been upvoted from the communal account, @minnowsupport, by djynn from the Minnow Support Project. It's a witness project run by aggroed, ausbitbank, teamsteem, someguy123, neoxian, followbtcnews, and netuoso. The goal is to help Steemit grow by supporting Minnows. Please find us at the Peace, Abundance, and Liberty Network (PALnet) Discord Channel. It's a completely public and open space to all members of the Steemit community who voluntarily choose to be there. Thank you! I hope that you are having wonderful holiday as well! Hello @justaboutart! This is a friendly reminder that you have 3000 Partiko Points unclaimed in your Partiko account!